Craft Day at the Shop! Last week we took a couple of hours in the morning to have some fun in the shop. We had some extras of some popular sayings that are trending right now, mostly the classic Keep Calm And Carry On phrase, so we decided to do some painting. Some were done a little more traditionally while others experimented putting together fun and bright colors such as the one shown in the picture. We then decided to list them on Etsy at discounted prices just for you! Go check them out HERE! 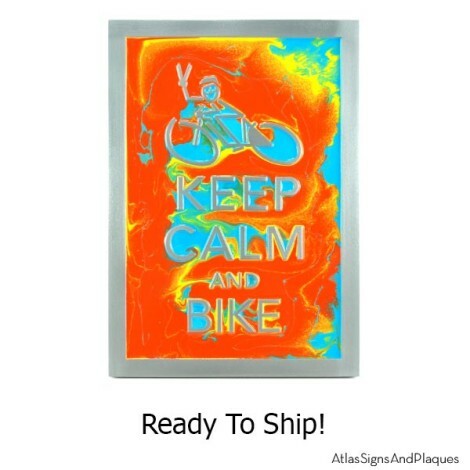 This entry was posted in What we LIKE and tagged bike on, carry on, finished, gift, home decor, housewares, keep calm, kiss on, love on, metal coated, wall decor on October 20, 2014 by AtlasSigns. Trio of Trees Address Plaque blends your house address numbers with the shape of the mixed forest. The tree shapes embraces both deciduous and coniferous shapes and fit homes burrowed in a wooded city lot or cradled next to a meadow pond. The Trio of Trees Address Plaque has everything except the squirrels. Atlas Signs and Plaques is all about shapes and doing the unexpected. It is a guarantee that you won’t find anything like the Trio of Trees Shaped Address Numbers anywhere else in the world. Why? Because it was designed and produced in Lake Mills, WI. 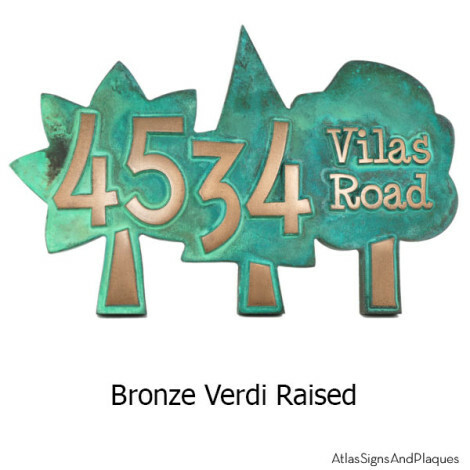 This entry was posted in NEW - Be in the KNOW and tagged address, Address Plaque, decorative, finished, home numbers, housewares, metal coated, personalized, street numbers, trees, trio of trees on September 8, 2014 by AtlasSigns.